Going into Lotta Sea Lice, I knew exactly what to expect. That was, an average album that tried to do nothing more than to be average. 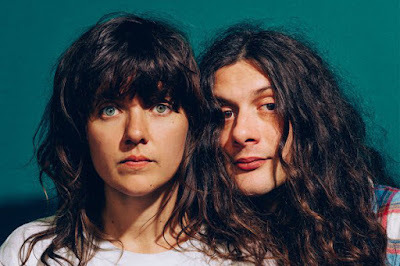 Take the two halves, Courtney Barnett and Kurt Vile, apart and the story changes slightly. Barnett surprised many, including myself, with her strong, impressionable debut Sometimes I Sit And Think, an album that gracefully combined her Singer/Songwriter mentality with that of a more modern, Indie Rock approach. Vile, on the other hand, hasn't truly accomplished anything of note, acting as the aged, Folk equivalent of Mac DeMarco, gliding by on life's simplicities one chord and hearty vocal strain at a time. Push the two together, for sake of amicable homeliness, and the result is nine, guitar-based tracks that ooze nonchalant apathy. There's nothing inherently wrong with this, as albums as unconcerned as Lotta Sea Lice help to differentiate those that aim for importance, but Barnett and Vile's continent-bridging unison won't alter, shift, or poke the Indie scene in any meaningful way. Admittedly so, I wasn't transfixed on Lotta Sea Lice on my first three listens, as I was visually preoccupied playing a video game as the dueling Singer/Songwriter's played on in the background. But in each of those instances, when 'Untogether' softly came to a rest with silence looming afterwards, I was left unphased, unmoved, and uninterested in any of the preceding moments. After listening more intently, I could see why. Nothing piqued my curious ear, apart from the cheesiness of 'Blue Cheese's' silly banter. Every sound, style, structure, fell into line. 'Continental Breakfast,' 'Fear Is Like A Forest,' and 'Untogether' dissolve into triviality, whereas efforts like lead single 'Over Everything' or 'Outta The Woodwork' are saved, temperamentally, by large, boisterous climaxes. They're formulaic by design, but at least add that necessary punch during your midday catnap. Looking back, and through, 'On Script' takes the cake as best track. The disgruntled tones, Grunge-like reverb, and thunderous conclusion cause the Barnett-only cut to act more like a single to her next LP, and less like a deep cut on an album freed of concern. Was 'On Script' worth the effort of bringing Barnett and Vile together for Lotta Sea Lice? No. But it does work as a nice gift for those seeking more than the median.